Who will serve as Marin’s federal and state representatives and fill important seats on local boards will be determined when voters go to the polls on Tuesday. But no race has attracted more attention than the run-off between two experienced prosecutors vying to replace retiring District Attorney Ed Berberian. 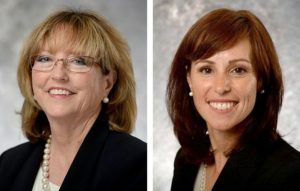 Lori Frugoli, a veteran Marin County prosecutor, and Anna Pletcher, who spent 10 years working as a prosecutor for the U.S. Department of Justice in San Francisco, have waged an often acrimonious battle for the job, alternately accusing each other of improper behavior. The two candidates have collected more than $800,000 in campaign contributions counting the June 5 primary race in which Frugoli finished ahead of Pletcher by 13,441 votes. Marin County Registrar of Voters Lynda Roberts is anticipating a good turnout for the election in Marin. Roberts said there are 160,794 Marin residents registered to vote in the election. She said her department has mailed out 126,436 vote-by-mail ballots and already received 44,991 of those ballots back. It is still possible for Marin residents to register to vote at the registrar’s office in Room 121 at the Civic Center. “At this point people have to come to the department to register, and they have to vote at the same time,” Roberts said. The office will be open from 8 a.m. to 4:30 p.m. Monday. Polls will be open 7 a.m. to 8 p.m. on Election Day. All vote-by-mail ballots must be postmarked on or before Election Day and received within three days after the election to be valid. Ballots that aren’t mailed must be returned by 8 p.m. on Election Day to a polling place or the elections office. Other high-profile local items on Tuesday’s ballot include three tax measures. Measure W, which proposes increasing the transient occupancy tax for hotels and short-term rentals from 10 percent to 14 percent has been contentious. Measure W has received strong opposition from a group of West Marin innkeepers who say the fee increase will hurt their businesses. The innkeepers say they are suffering already due to competition from short-term rentals. Supporters of Measure W say a lack of affordable housing exacerbated by fallout from short-term rentals is gutting West Marin communities. They say revenue from the tax is urgently needed to enhance fire and emergency services in West Marin and support long-term community housing. Another measure of consequence is Measure AA, which would renew the county’s existing half-cent sales tax for 30 years to pay for transportation-related expenses. The tax doesn’t expire until March 31, 2025, but the Transportation Authority of Marin wants to renew it now to get voter approval for an updated spending plan. The initial tax, which was approved on Nov. 2, 2004 with the support of more than 71 percent of voters, yields close to $25 million annually. If the amount of money raised to pass a ballot measure is indicative of its significance then Measure J would also rank highly in Tuesday’s election. The Tamalpais Union High School District is proposing a $149 parcel tax for four years. The measure also calls for an annual cost-of-living adjustment of 3 percent. As of Oct. 20, supporters of Measure J had received more than $239,000 in campaign contributions with Tam High Foundation and Redwood High School Foundation each contributing $49,999. Contests for federal and state office received less attention largely because they aren’t considered to be competitive. Sen. Mike McGuire, D-Healdsburg, is being challenged by Veronica Jacobi, a former Santa Rosa councilwoman. Marc Levine, D-Greenbrae, is being challenged by Dan Monte of San Rafael, a retired general contractor and paratransit bus driver, who is also a Democrat. Rep. Jared Huffman, D-San Rafael, is competing for his seat for the third time with Republican Dale Mensing, a supermarket cashier and supporter of President Donald Trump. None of the challengers in these races raised significant amounts of money to aid them in their quest to unseat their well-financed, incumbent opponents. There are also races for seats on the boards of the Marin Community College District, Marin Municipal Water District, North Marin Water District and Marin Healthcare District. Greg Knell, a trustee on the San Rafael Board of Education, is challenging incumbent Jack Gibson for his Division 1 seat on the Marin Municipal Water District board. Joby Tapia, an investment adviser with NAI Northern California, a commercial real estate firm, is challenging incumbent Cynthia Koehler for her Division 4 seat on the water district board. There are six candidates competing for three seats on the Marin Community College District board. Incumbents Diana Conti and Wanden Treanor are vying with Andrew Cullen, Robert Ovetz, George Rothbart and Suzanne Brown Crow for the seats. Three candidates — Tina McMillan and incumbents James Grossi and Richard Fraites — are competing for two seats on the North Marin Water District board. In the race for three openings on the Marin Healthcare District board, incumbents Jennifer Rienks and Larry Bedard are competing along with two surgeons — Brian Su and Edward Alfrey — and Melissa Bradley, the owner of Bradley Real Estate. There are 14 other local measures on the Nov. 6 ballot as well. Measures L and M are focused on the city of Sausalito. Measure M proposes restructuring the city’s business tax to charge $125 per business plus $1 to $3 per $1,000 of gross receipts; Measure M would boost Sausalito’s hotel tax from 12 percent to 14 percent. The ballot will also include another school bond measure, Measure I. Shoreline Unified School District is proposing a $19.5 million bond offering. Property owners in the district would be assessed an estimated $39 per $100,000 of assessed value. It is estimated that collection of the tax assessments would begin in fiscal 2019-20 and extend until 2044-45. Most of the remaining measures involve fire and emergency services. Measure U is the Southern Marin Fire Protection District’s proposal for a $200 annual parcel tax that would remain in place until ended by voters. Fire officials say the tax would generate about $3 million annually. All eight members of the Ross Valley Paramedic Authority — Ross, Corte Madera, Larkspur, San Anselmo, Kentfield, Fairfax, Sleepy Hollow and County Service Area No. 27 — have submitted ballot measures: K, O, N, P, Q, R, S and T.
The members, with the exception of Corte Madera, are proposing to renew a parcel tax that is scheduled to expire on June 30, 2019, through 2022-23. Their measures would also increase the existing $75.50 per parcel tax $4 each year. That would increase the parcel tax to $91.50 by the time it expires. Corte Madera, which began providing its own paramedic services in 1998 as a subcontractor to the Ross Valley Paramedic Authority, has a ballot measure, Measure N, that would renew its special paramedic parcel tax at the current rate of $75 per year for each residential unit or $75 per year for each 1,000 square feet of non-residential use. Corte Madera’s measure would extend its parcel tax for another four years until June 30, 2023.